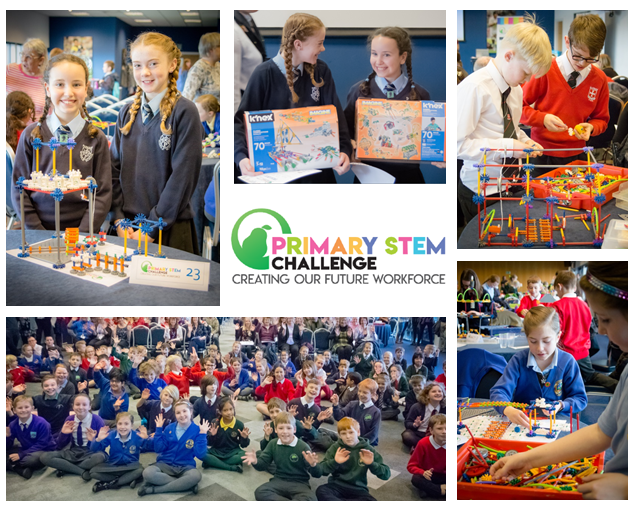 The Worcestershire Primary STEM Challenge is delighted to announce that the programme will continue into its third year after yet another successful final which took place at Sixways Stadium on 22nd March 2019. Designed to inspire the next generation of engineers, the Primary STEM Challenge provides workshops for participating primary schools across Worcestershire to improve their science, technology, engineering and maths (STEM) engagement. The programme, run by STEMworks, is run in partnership with Worcestershire County Council, Worcestershire Local Enterprise Partnership and District Councils across the county. The children, aged between 9-11, initially took part in the 2.5 hour workshop at their school during which the children were asked to build a model of a train station using K’Nex – a theme chosen to celebrate the Worcestershire Parkway train station which is currently under construction. The winning team from each school’s workshop were chosen to represent their school at the final. On 22nd March, children from 38 schools attended the final at Sixways Stadum to build their train station models that needed to include at least 2 platforms, a café, toilets, ticket desk and above all it had to be fully accessible. The children were given an hour and a quarter to complete their model which was then scored by a panel of judges. Many congratulations go to Masie and Sophia from Parkside Middle School, Bromsgrove, who won the 218/19 final for demonstrating excellent teamwork and communication skills throughout constructing their brilliantly designed model. Ben and William from St John’s Middle school in Bromsgrove took second place. A number of the county’s high profile businesses sponsored the event, including: Mazak, SouthCo, Specsavers, Worcester Bosch, Speller Metcalfe and Hewett Recruitment who supported the event by either providing a judge for the final or by providing goodie bags which were presented to every participating student at the final. The programme’s stakeholders have committed to supporting the project for another year with workshops starting in the Autumn Term of the 2019/20 academic year, the final will take place at the end of May 2020. For schools looking to register to take part in this exciting challenge, contact admin@stemworks.co.uk to obtain a registration form.